The St. Adalbert Roman Catholic Church English Choir brings a blend of contemporary and traditional music to our Sunday liturgies. The choir rehearsals are every Sunday after 11:30 am mass until 2.00 pm in the choir loft of the upper church from September to June. The St. Adalbert Choir welcomes new members and encourages participants of all ages to rehearsal liturgical celebrations. Please contact Ruslana Petryazhna, Music Director for details. With your heartfelt commitment to the Music Ministry, you can help to embellish our liturgical celebrations, and offer God and our community the first fruits of your time and talents. Let music help deepen our faith. The beginnings of the choir go back to 1918 when Fr. Anthony Witkowski OFMConv. initiated the Choral Society of St. Cecilia. While Latin and Polish were certainly the mainstays of the choir for many years, with Vatican Council II’s liturgical shift in perspective to the vernacular, an English language choir was established in 1976 under the direction of Fr. Carl Zdancewicz OFMConv. and Stephen Galizia. In addition to enhancing the celebrations of the 5:30pm Saturday Vigil Mass, the choir provides the music for all major liturgical celebrations. The members rehearsed weekly. The membership of our Senior Polish Choir were committed to both maintaining and updating their repertoire of Polish liturgical music for the benefit of the worshipping community. Enhancing the music ministry, the Junior Choir and the 11:00 am Lower Church Choir. St. Adalbert’s Junior Choir consisted of forty-five boys and girls ranging in age from eight to fourteen years old. These children lead the 9:30 am Sunday Children's Mass and take part in other combined choir activities. Paul Canestro directed our 11:00 am Lower Church choir in addition to being St. Adalbert Parish’s cantor. With Sr. Mary Ellen’s guitar accompaniment, a beautiful blend of musical styles was achieved. 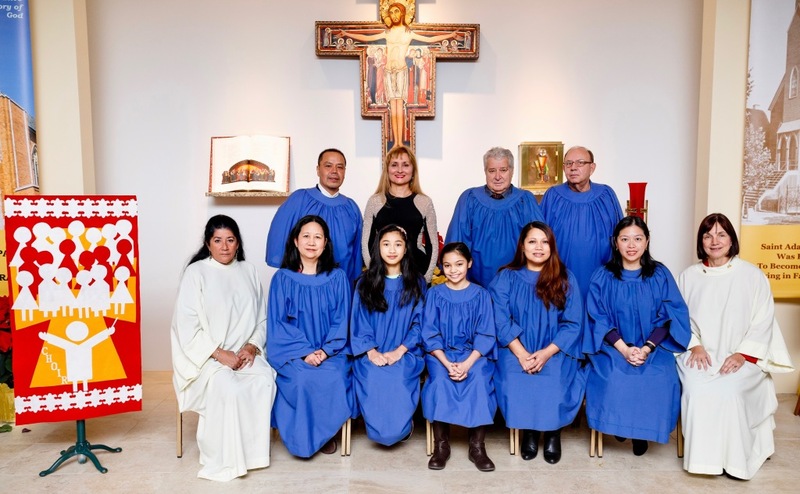 Under the leadership of Music Director Ruslana Petryazhna, the choir music remains an essential part of the yearly liturgical celebration at St. Adalbert. Choir members have learned an extensive classical and contemporary choral music program and have sung Vespers during the Advent season. For many years, they have engaged in highly time consuming preparation of the variety of compositions with three voices such as “The Waiting World” (K. Morrison), “He Was Wounded” (A. Vivaldi), “Christmas Noel” (J. Ray) and others. Through the dedication and perseverance of each member especially the cantors the choir continues to develop their vocal and sight reading skills to lead the congregation in song. St. Adalbert’s choir continues to enrich the liturgical celebrations with the addition of new members who enjoy proclaiming God’s word through song.